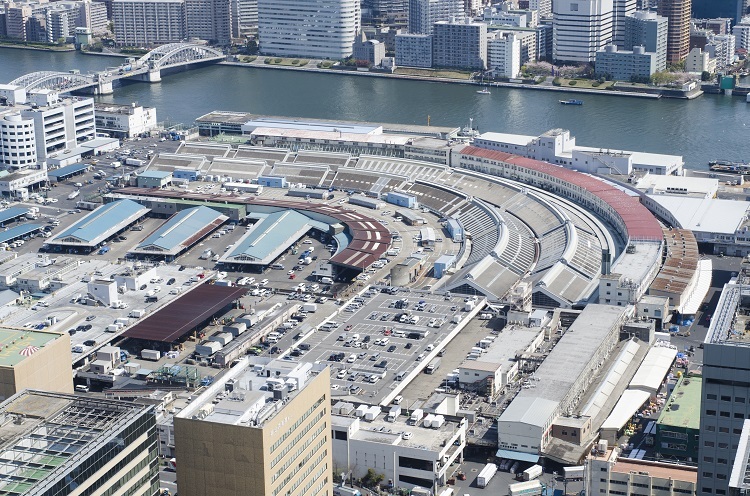 Tsukiji market （築地市場、Tsukiji shijyō） is the largest wholesale market in the world and one of the popular sightseeing spots for foreigners. 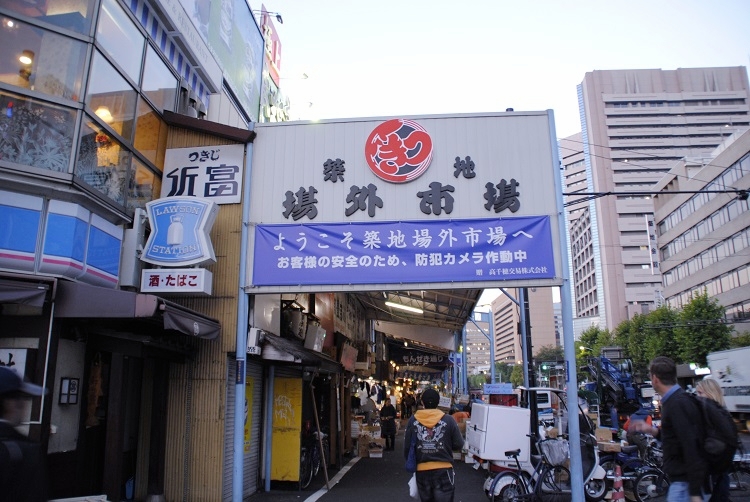 The inside the market is called "Jyōnai （場内）" in Japanese, and flesh seafoods, meat, vegitables, and fruiuts from all over Japan are wholesaled. Also, some of the auctions are open to common people, and English speakers guide and explain how the auctions are progressed. The outside is called "Jyōgai （場外）", and ther are a lot of seafood restaurants. Almost all restaurants are open from 5:00, so you can have breakfast after observing auctions. If you don't apply to the Tuna Auction Observation, you can't enter the area for the auctions before 9:00. Except on Sundays, national holidays and some Wednesdays (Please check the official site), Tsukiji market is open, and auctions are held from early morning to 9:00. The area for auctions are restricted to wokers before 9:00, so if you want see auctions, you need to apply to the Tuna Auction Observation. 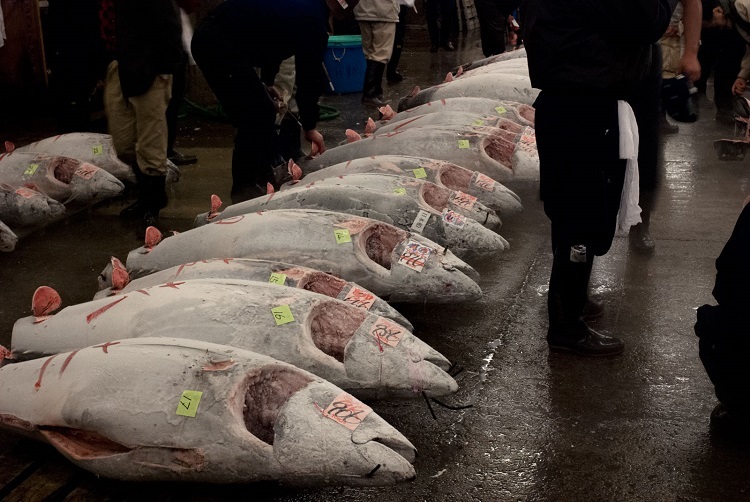 The Tuna Auction Observation are held 2 times in a day (1st: 5:25~5:50, 2nd: 5:50~6:15), and the number of participants is restricted to the first 120 people (the reservation is not accepted). The application starts from 5:00, and you need to follow the procedures at the Osakana Fukyu Center （お魚普及センター）. If many people wait for applying to the obserbation, there may be cases when the application start ahead of time. Basically, the market is the area for distributors and buyers, and they work seriously. Therefore, you must keep some rules when you are inside the market. 1. There are some part of the market thet common people are not allowed to enter. 2. Do not retard workers and vehicles (turret trucks) passing. 4. Do not bring infants, strollers, big luggage, and pets. 5. Do not enter with sandals and high heeled shoes because the floor in the market is very slippery. 6. Somking is forbidden in the market. 7. Do not disturb workers in Tsukiji. In the area of outside the market, more than 400 restaurants are open, and you can enjoy flesh seafood cuisine with low price. Originally, they do buisiness for wokers in Tsukiji, but recently, they welcome tourists including foreigners, and meny restaurants have English menu or wokers who can speak English. Mainly, they open from 5:00 to 13:00 and rest on the days when Tsukiji market is closed.